Shorting the market can create amazing trading opportunities. Coach Federico Bustos provides us with insight from the phenomenal market collapse over the last couple of days. 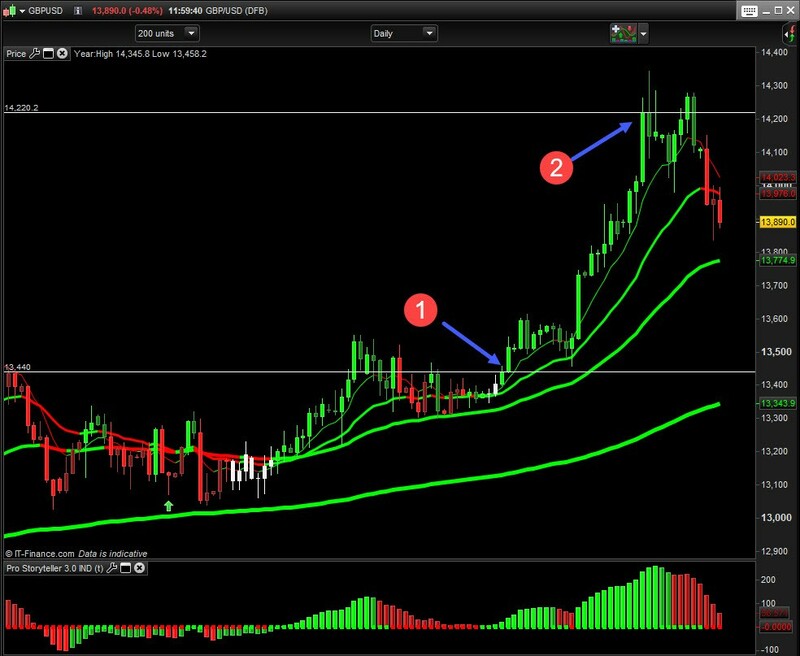 Using the Pro-Trading System can allow you to spot opportunities even when the markets crash! The Pro-Trading System fired a signal on GBPUSD towards the end of December 2017. At the time, the market price was around 13,440 (1). If you look directly below, the Storyteller Indicator was showing us a small histogram and the exponential moving averages were providing us with a great amount of support. Since then, the price rocketed up to 14,220 (2) which represents a net profit of approximately 800 pips. Not bad at all considering that was just one trade! Once you’re in the trade, you just need to let the market do its job. If you look closely at the bottom of the chart, we have a couple of indications that were giving us warning signs about what would be happening in the market. As you can see, the Pro-Trading System fired a red signal. This red signal along with The Storyteller Indicator showing us a very extended market indicated that we could expect the market to rotate and the strength of that movement was coming to an end. 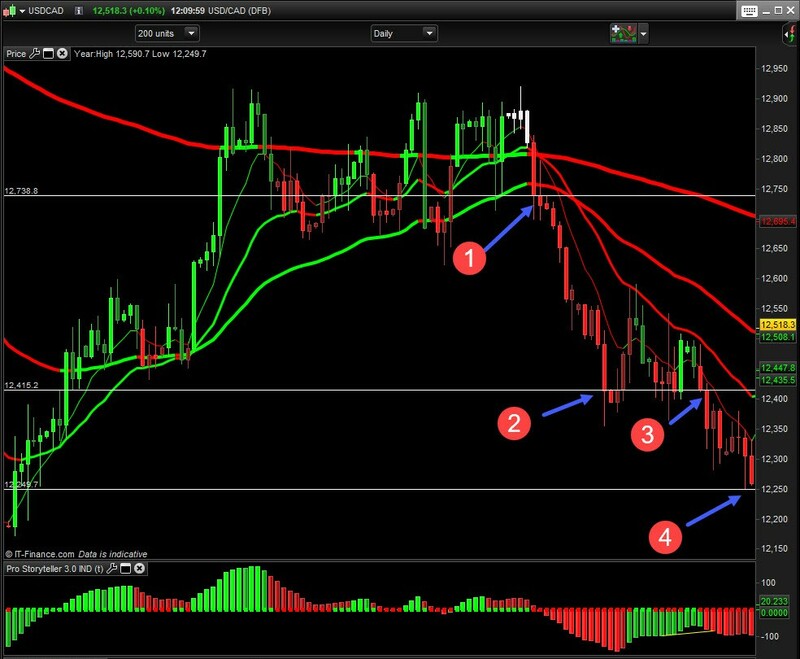 The USDCAD is another great example of the power of trading with the trend. It is extremely valuable to have a system in place that gives you the right time to enter a market and the confidence to know when to exit the market. In mid-December 2017, the Pro-Trading System fired a signal to sell at around 1,2738 (1) giving us a fantastic profit of 300+ pips in less than a month. The area where the price bounced was around 12,415 (2) and a couple of days later the Pro-Trading System gave us another signal to sell this market again around the same price (3). This was a quicker trade with another 150 Pips of profit. The closing price was around 12,249 (4). In the chart below, we take a look at the Dow Jones Index. Towards the end of November 2017, the Pro-Trading System fired a signal to buy the Dow Jones – the price of the index at the time was around 23,578. Once more, the exponential moving averages were giving fantastic support and the Storyteller Indicator had a small histogram confirming we were trading with the trend and the momentum was also on our side with a lot of potential for further growth. 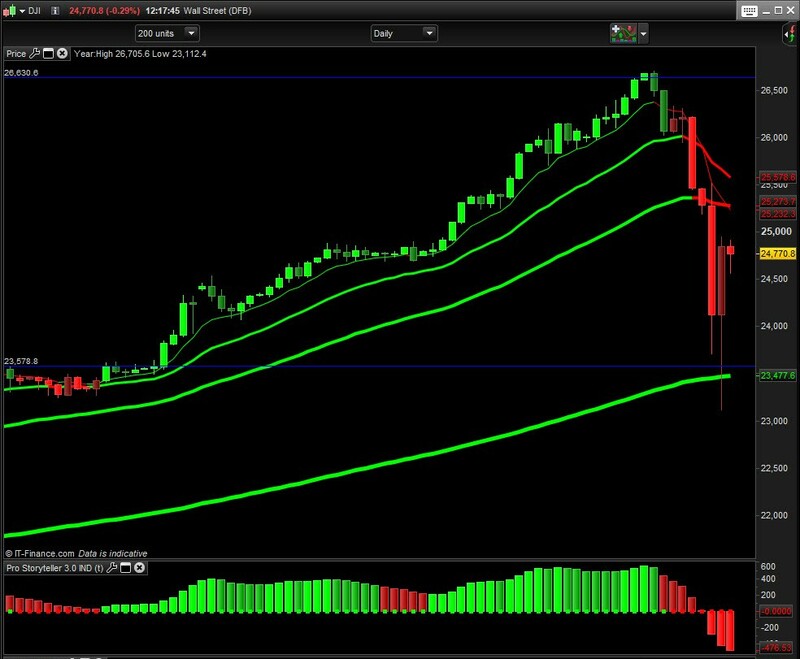 The Pro-Trading System gave us a fantastic signal resulting in a profit of over 3000 pips. We knew it was time to exit the trade when the market was extended which was shown beautifully with the Storyteller Indicator once more. A couple of days later, the Pro-Trading System fired a red signal confirming that the trend was coming to an end. Shortly afterwards, the Dow Jones collapsed with a drop of over 2000 pips.